With the GOP facing historically narrow margins in the Legislature, Gov. Doug Ducey kicked off the 2019 legislative session with a call for bipartisanship on key issues like water, K-12 education, school safety and legislative immunity. 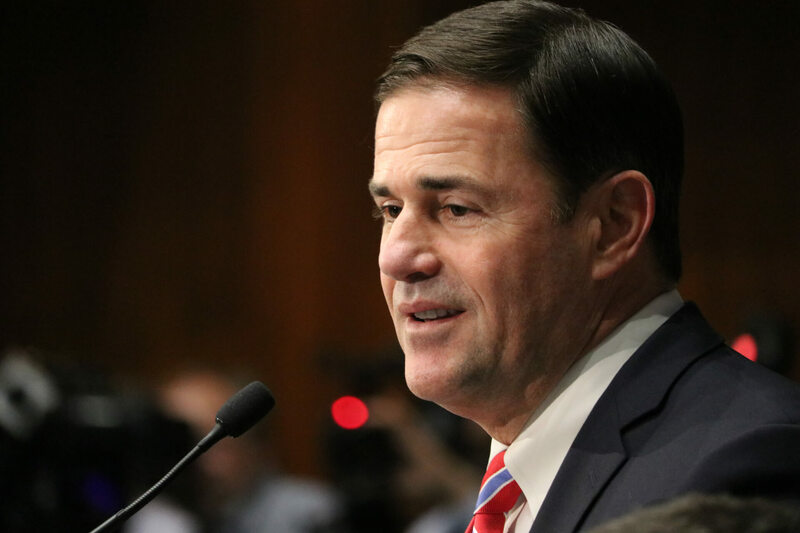 In his first State of the State address of his second term, Ducey on Monday told a joint session of the Arizona Legislature that Democrats and Republicans can find a lot of common ground this year. “I’m not here just to work with Republicans on Republican ideas. And bipartisanship doesn’t simply mean working with Democrats on Democratic ideas. I’m here as governor of all the people to work with all of you on good ideas,” Ducey said. Republicans outnumber Democrats by just 31-29 in the Arizona House of Representatives – the GOP’s narrowest margin since it first took control of the chamber in the 1966 election – and by 17-13 in the Senate. Legislative Democrats are hoping for a bigger seat at the table, especially in the House, where Republicans can’t afford a single defection on party-line votes. First and foremost, Ducey called on Democrats and Republicans to work together on perhaps the most pressing issue facing the state, the passage of a Drought Contingency Plan. Former Gov. Bruce Babbitt, who negotiated the state’s 1980 Groundwater Management Act, and former U.S. Sen. Jon Kyl, a renowned water expert, sat in the front row as Ducey spoke of the need to alleviate Arizona’s 19-year drought. The U.S. Bureau of Reclamation has set a Jan. 31 deadline for the state to approve its Drought Contingency Plan, or else the federal government will tell the state how much Colorado River water it gets. “This issue is important and it’s urgent. Our economy. Our environment. Our future. Let’s prove we can work together in a bipartisan fashion and get this done,” the governor said. Ducey went on to outline several other areas where he said Democrats and Republicans can work together this session. The governor called for the elimination of legislative immunity, a provision of the Arizona Constitution that protects lawmakers from arrest for non-felonies during the legislative session. The issue has come up a couple times over the past year. Former Rep. Paul Mosley invoked legislative immunity after being pulled over going more than 40 miles over the speed limit. And the Department of Public Safety alleges that Rep. David Cook, R-Globe, handed an officer his House of Representatives identification card when he was pulled over and subsequently arrested on suspicion of drunk driving. Only the voters can amend the Arizona Constitution. Rep. T.J. Shope, R-Coolidge, plans to sponsor a proposal to refer the issue to the ballot, and Ducey urged lawmakers to approve it. Charter schools have come under scrutiny in recent months, largely due to reporting by the Arizona Republic that highlighted a lack of financial oversight and self-dealing by charter school operators. Democrats have long called for more oversight on charter schools, and school choice advocates such as Ducey have now joined that chorus. Parts of Ducey’s speech portended likely fault lines for the session. Perhaps nothing will be so contentious as the state’s budget surplus, which is sure to generate a plethora of plans on how to spend it. Arizona has a projected $1.1 billion budget surplus – $200 million in ongoing revenue and $900 million in one-time money. But despite the biggest surplus in about a decade, Ducey said his budget proposal, which he’ll release on Friday, will be “light reading” for a surplus year. Ducey warned against repeating the mistakes of the past, when Arizona spent freely, only to make massive cuts during the multi-billion-dollar budget crisis it faced in 2009 and 2010 due to the Great Recession. The primary budget commitment the governor made was to continue funding the 20-percent teacher pay raise he committed to last year, a concession to the #RedforEd movement that culminated in a historic teachers’ strike. Half of the raise has already gone into effect, and the remainder is to be phased in over the next two years. “To anyone out there considering using these resources somewhere else, I have one message: Don’t even think about it. These are raises teachers earned and they are raises we are going to fulfill and protect,” the governor said. Ducey also said Arizona should “prepare for the inevitable” by pouring more money into the state’s rainy day fund in anticipation of the next economic downturn. To help the state prepare, Ducey proposed increasing the state’s rainy day fund to $1 billion. The fund currently has about $462 million, which is about 4 percent of general fund revenues. State law caps the fund at 7 percent of the general fund, meaning the Legislature will have to raise that statutory cap in order to grant Ducey’s request. “If ever there was a way to protect public education, to protect the pay raises our teachers have earned and deserve, to prevent budget gimmicks, Band-Aids and massive cuts down the line, to avoid tax increases and budget standoffs and government shutdowns, it’s through this thoughtful, prudent and fiscally conservative approach,” Ducey said. Ducey also urged lawmakers to revisit his Safe Arizona Schools plan, which could face opposition on both sides of the aisle. The proposal, which the governor pushed in the wake of the devastating shooting that killed 18 people at Marjory Stoneman Douglas High School in Parkland, Fla., in February 2018. But the plan fell short in the face of opposition from legislative Republicans who believed a provision for Severe Threat Orders of Protection, which would have made it easier to temporarily bar people from possessing firearms if they’re believed to be a threat to themselves or others, infringed on Arizonans’ right to bear arms. The State of the State speech was light on surprises, but Ducey did make one unexpected announcement when he told the crowd that the state officially owns ins Capitol buildings once again. The state mortgaged off several buildings, including the House, Senate and Executive Tower, to raise money during the 2009-10 budget crisis. “Breaking News – somebody call ‘The Daily Show,’” Ducey said, referencing the satire news show’s segment about the sale of the Arizona Capitol in 2010.